I would like to be capable of fully believing myself a woman who, for idiosyncratic and cultural reasons, often chooses to present a male appearance, as much as I believe myself a man who at times chooses to appear female. These are not beliefs that can be made by mere will. 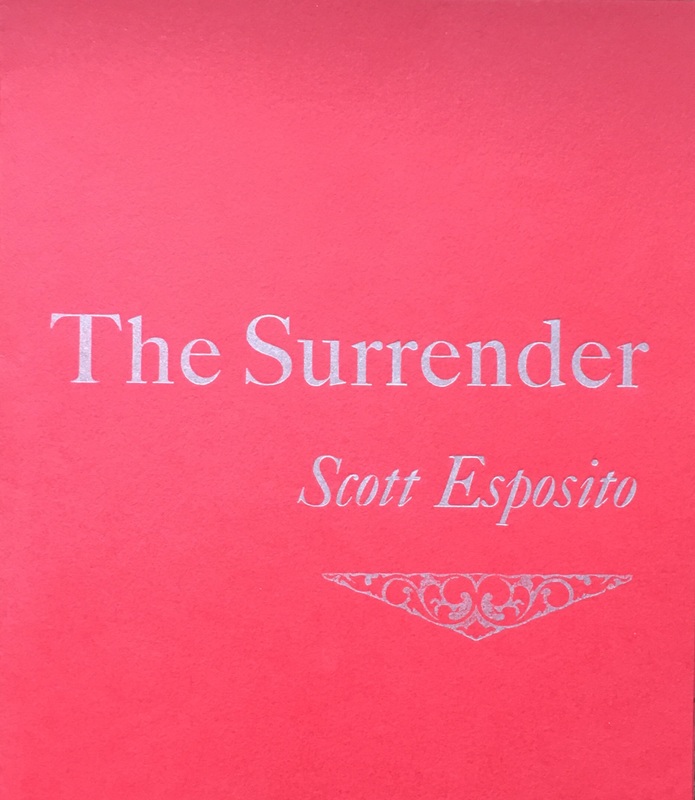 Complex and often contradictory, The Surrender is a collection of essays – as Scott Esposito insists, not a memoir – that accounts for the impact of society’s convenient aggregations of gender on personal identity. Language plays a critical role in the public defining of gender and codifying of appearances, and The Surrender documents the search for a volume of words to approach an innate being within that societal artifice. In somewhat of a contravention of Audre Lorde’s aphorism, “The master’s tools will never dismantle the master’s house,” Esposito writes to survey the lens society constructs for us to view ourselves, the material of his own biography being predicated upon that construct, by using the same language, the same polar binaries of gender as bookends to search the spaces and mechanics between. Because these words are tools of society, and because the search is manifest ultimately, and productively, in words, the book is filled with uncertainty, not from Esposito, not about himself, but about the value of, and the nature of this linguistic lens of gender, and about how meaningful that lens should be to those of us who inherit it, and inescapably view ourselves through it, but recognize that it is artificial.The most fascinating aspect of The Surrender is its project of reclaiming the thickness of language to describe a true self that is hermetically innate, but also temporally complex. This is especially pertinent because it is social language itself that recognizes the self, yet demands that it not simply exist, silent and ineffable. I wanted to be seen. I was tired of that sad, conflicted expression in the mirror as I slipped off my garments one by one and washed off my make-up. I no longer wanted to think of myself alone with my secret. This image of Esposito is heartbreaking. “Have you ever looked in the mirror and thought what you saw might be a complete lie?” he asks. This image is significant in addressing the cyclical duality between who we know ourselves to be and how that being is defined by societal regimes like appearance, biography, and language. The film of appearance is the only tangible regime of the three. Language is ephemeral but viral. Biography is tremendous but private. This image of changing before the mirror articulates the realization that aspects of one’s identity can exist in such a thin film, and that this seemingly innocuous film is contested by the societal regimes that intractably manifest them. Writing and publishing The Surrender creates a phase change. The immaterial linguistic and biographical networks of gender become material and can be confronted. Reciprocally, the aspect of gender’s physical appearance typically controlled by the cultural artifice of the other two becomes untethered. This, this ache — it is not neat. It is not neat at all. It is a dissonant note that should never resolve. The lie of a narrative is useful: we may assign each memory a time, place, and function. It is a way to declare a trajectory. I think there is truth in this method. But it also bears deception. 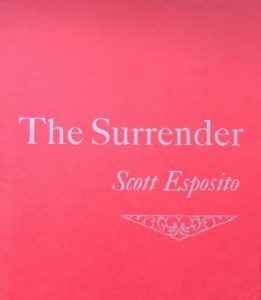 The matter of The Surrender is necessarily biographical, but even inasmuch as this is narrative-based, Esposito does not quite submit to that as a form. The text exists far more in the digressive temporality of Tristram Shandy or Austerlitz than a mainstream biographical memoir. Every book functions as the distillate of nonverbal cognitive fields into text. But the productivity of some books is predicated on that function. A book like The Surrender that is so much about the proper fit of a word scrim over an entire life of cognitive fields cannot avoid being an unrecognizable oversimplification when measured against the digressive and ephemeral intrusion of fleeting thoughts and stimuli that every instant consider who you are, what articulates your identity, what precipitates the thought itself. While such thoughts accrete, they form the identity, and are so voluminous, so recursive, and of such a fine grain as to be undetectable, but always accreting. All the same, if the only possible manifestation is something more like the twilit scrawl of an absent skater on a frozen pond, The Surrender is very effective. The crux is the desire to articulate this ineffable in words. Not only to cement that ineffable in printed text, but to articulate its fragility in the character of the prose. Thus the prose lopes and loops. The actual distance traveled by the text is far greater than the direct space between beginning and end. These are time signatures taken in order from three pages of text. It was not until a year after . . . At the beginning of the year . . . Nine years previously . . . A few days later . . . Nine years later . . . The day I first . . . For months . . . That was the beginning . . . That day in July . . . The logic of the three essays unfolds with parallel circuit causality and temporality to the prose that presents conclusions prior to questions, and shame prior to actions. This is not a question of baiting the reader in medias res, but more of the difficulty of saying which is more important, the fact that a question emerges because of societal constructs, or the fact that Esposito is able to find inner strength to contextualize it, the fact that shame is latent in societal constructs, or the fact that Esposito is acting in the way that is truly him, himself, without society. What was brought to mind in the recursive temporality of Esposito’s text was a short poem in Alta Ifland’s recent volume Voice of Ice. The piece, which is the second poem in the volume, is titled First Line. This is it in its entirety. I wish I could write a first line that belonged to no one / and would be the exact opposite of the desire to write / that gave birth to it. A deadly, frozen breath would / blow through its bowels, sealing with a burning touch / each word’s face and imprinting on it the grimace of a / newborn who comes into daylight as if into darkness. / All the terror of what is dragged into being will explode / in these faces, which will then recede, terrified by the / vertigo of being, like a snail’s fearful horns. I will be all at / once the snail’s horn, the hand reaching toward it and the / newborn stopped half-way in the mother’s womb. I will / also be the mother’s body, dead at the moment when the / newborn meets the first ray of light. Three things are pertinent to overlay on continued understanding of The Surrender. First, by placing this piece second in the volume, Alta comments on the first piece, and on the potential of all pieces of text to spring outward from their locus. The displacement of an epiphany from its supposed site is a mechanism for calling its absoluteness into question. Second, Alta’s desire to write a first line that is all lines, to write a first line that is all-encompassing, marks the absurdity implicit in the first fact, that all moments are the first. Third, the recursive quality of silence in the first line kills its enunciator. Perhaps more than the morsel of Alta’s poetry, The Surrender, in its mechanisms, recalls Marcel Bénabou’s Why I Have Not Written Any of My Books, a book that although only noted in the historical appendix of Esposito’s book The End of Oulipo?, he must at least be aware of. It could not be a more different book, but what Warren Motte calls its “specularity,” the “hall of mirrors where the writing subject and the subject of writing are infinitely . . . reflected,” is close kin. There are hordes of such texts, ranging from Auster to Roubaud to Nabokov, but none so much as Bénabou’s investigates the inherent specularity of writing. Writing is always the subject of writing. Not to devalue the above authors, but Bénabou understands that specularity needn’t be represented as a trope, it needs to be exploited as an inescapable property of the medium. Bénabou and Esposito recognize as much, and they both capitalize on it, though for vastly different reasons. In the beginning, a short sentence. Only half a dozen words; simple words, the first to come along, or almost the first. Assigned above all to mean that here ends a silence. It is this notion that it is never too late to begin articulating something. Esposito realizes this time and time again throughout The Surrender. The ballistic trajectory our minds are saddled with is gross, in every theater, from physics to history to biography. The preservation of recursive nuance and stuttering are vehicles of truth and possibility beyond the societal framings of cause. I recall only a solitary march toward I don’t know what kind of writing, a slow, hesitant march delayed indefinitely by the intimate conviction, from time to time reaffirmed, that, in any event, writing is futile. I gauge the enormous power regret confers on things and dutifully concentrate on the roads I have not taken, on the initiatives I have preferred not to seize. This echoes another very important realization of The Surrender, that although it is crucial to use language to articulate the hidden narrative of shame and acceptance wrought by societal norms, Esposito is who he is not because of the text. Yet, as he notes, “These realizations only arrived as I wrote this today, some side effect of the process of collecting these facts.” The text is an externalization of being that can at last be scrutinized in the material that produced its understanding of itself. Writing the text, like the mirrors Esposito long utilized to see himself in lieu of other people seeing him, is a way to see himself within the regime of language before he allows other people to see him. Writing is futile in the authentic construction of who Esposito is innately. This could be enough to silence a writer. Bénabou even notes it as one of the reasons not to write: “celebrating life and direct physical contact with reality as superior to writing.” Esposito notes that it took him quite some time to allow himself to begin writing. But even in light of the innate futility of the venture, because of the inextricable role that language has in defining us to ourselves, it is also inherently productive. With Bénabou this futility points singularly to what work, what “actual” writing, would exist outside the book, but does not, a very vocal evocation of silence. There is no resounding silence in The Surrender. It is proudly vocal. It is necessary and inspiring to those of us who fall outside its making. Still, silence lies in the slow uncertainty of its inherited language. Recursion is a form of elision, a skipping back, necessarily dusting over causality because nothing specific is a cause of anything else. Recursion is a form of elision that contains silence, but is not silent, in which silence speaks. Where the words themselves cannot manifest who Esposito is, the disposition and existence of the text as a whole, perhaps, can be. Though manifest also in language, the biographical regime presents a different, difficult circular logic into the search. It is crucial, and it is useful in what Esposito calls its “pleasing simplicity,” to someone approaching the book without any openness to the above panoply of concerns. But the insistence from without to define, or to situate one’s ultimate identity as innate, and not chosen, or not compelled through a series of events in a causal chain, can feed into the alternate rationalization that were this identity a chosen path, that it would then be wrong. It is a slippery argument, but telling in that transgender folks and advocates are compelled to make the argument of innate identity to opponents to assuage moral absolutism. This is not an explicit subject of The Surrender, but is implicit as the milieu of every question and every doubt that Esposito is forced to bring upon himself via these constructions that exist outside of him. How does one declare something that they are not sure how to articulate? At what point in this search for articulation does the declaration begin? The tack Esposito takes is a wholly public embodiment in text, an exploration of how to articulate, less to declare, for truly what is there to declare, a written search for the language to define something, a quality, or a constellation of qualities, that are innate, that are ineffable, that perhaps cannot be articulated, maybe not to the satisfaction of someone outside, perhaps to the satisfaction of the writer simply by writing what can be written, about something reflexively that only society expects one to define, or to articulate. Certainly Esposito knows himself without the text, but the desire to articulate through writing is one of knowing himself to others. Additionally, one cannot sell short the individual desire to articulate to oneself, because it is through the language of society that we are able to talk to ourselves, to process these ineffable qualities, and transform them into something we can confront, and to make the thin film objectively existent. There is no clear resolution as to the confines of gender in The Surrender. Esposito declares: “I knew that I had no need to feel unanimous, no need to accord with the social forces around me. My true state was a mixture of genres . . . an oscillation that was my true gender.” And, this is perfect. This lovingly true. This is him.